Deputy President William Ruto through Sports CS Rashid Echesa gave Shs 1 million, Tetemesha Group composed of county Women Representatives in Parliament donated Shs 1million, Nairobi Senator Johnson Sakaja brought Shs500,000/=, CS Eugene Wamalwa Shs200,000/=, COTU Secretary General Francis Atwoli Shs300,000/= CS Echesa Shs200,000/= Senate Speaker Lusaka Shs200,000/=, National Assembly Majority Whip Hon. Ben Washiali Shs120,000/= Hon. Shinali of Ikolomani and former Senator Boni Khalwale Shs100,000 each while most of the MPs present donated amounts ranging from Shs30,000 to Shs60,000 each. Besides dwelling on 2022 succession politics, most of the leaders also focused on development milestones in Kakamega, giving deserved credit to H.E. Wycliffe Oparanya whom they acknowledged as a model development focused leader. 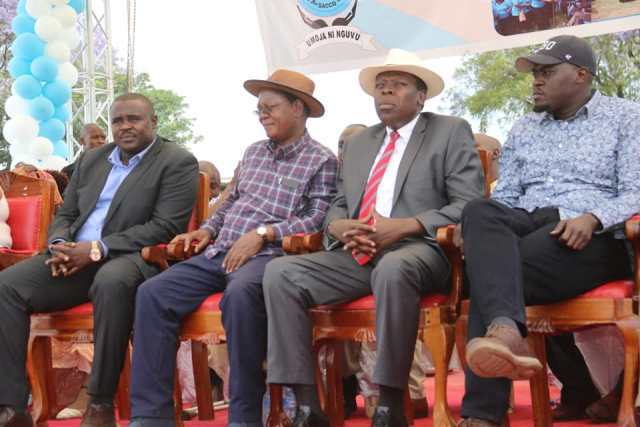 The leaders supported Oparanya’ leadership of the Lake Region Economic Bloc and his State House 2022 bid. KACOMA SACCO has started off on a high note with 12,000 registered members with Shs20 million in its bank account. Also present were Hon. MCAs of Kakamega, CECMs, Chief Officers and Advisors all of whom donated generously.